Lamb is one of my favourite meats and it works so well with Middle Eastern spices. I have used leg steaks in this recipe, which is unusual for me as I usually favour the slow cook cuts such as shoulder or neck. I tend to buy a whole or half leg of lamb and then cut what I need for dishes such as this because it’s cheaper. You can’t beat cooking meat on the bbq but they can just as easily be cooked on a griddle pan if bbq’ing is not an option. This dish is such an exciting mix of flavours, texture and colour and is a feast for the eyes as well as the tastebuds. If you don’t want to push the boat out and use saffron then the couscous is still tasty without. It’s not essential but it does add a beautiful colour and exotic note. The watermelon and feta side salad is so unexpectedly good (I sadly admit I had never tried the combination before) and the mint lifts it and is incredibly refreshing on the palette. It’s a perfect accompaniment so give it a go and I’m sure you’ll be as pleasantly surprised as I was. When using spices, it’s definitely worth buying whole seeds and then creating a spice mix when you need it. It does require a small amount of extra effort than using ready-ground spices but they stay fresher for much longer and the flavour is more intense. By all means use ready ground spices if time is short. Toast the cumin seeds in a dry frying pan over a medium heat until the aroma is released. Bash to a fine powder using a pestle & mortar and add to a dish big enough to hold the lamb. Mix together with the sumac and oil then add the lamb and coat thoroughly. Cover with clingfilm and set aside. Marinade for at least 1 hour if you can. Prepare the salad by combining all the ingredients, apart from the feta, in a serving bowl. Crumble the feta on top and set aside until ready to serve. Prepare the tahini dressing by combining all the ingredients together in a small bowl and season to taste. Set aside. Bring 200ml of vegetable stock in a saucepan to a simmer, then add the saffron and leave to infuse for 20 minutes. Bring the saffron infused stock back up to the boil and add the couscous, olive oil, lemon zest and raisins. Cover with a tight fitting lid and let stand for 10 minutes. Fluff up the grains with a fork and then add the spring onions and corriander. Heat up the bbq or griddle pan until smoking hot. Season the lamb on both sides and cook on a high heat for 3-4 minutes on each side depending on the size of the steaks and how pink you like it. Allow the meat to rest for a few minutes before serving. 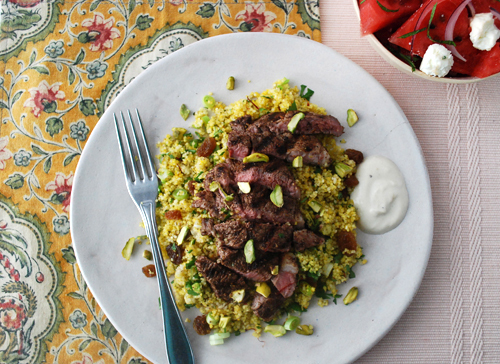 Place a lamb steak on a large spoonful of couscous and scatter with chopped pistachios. 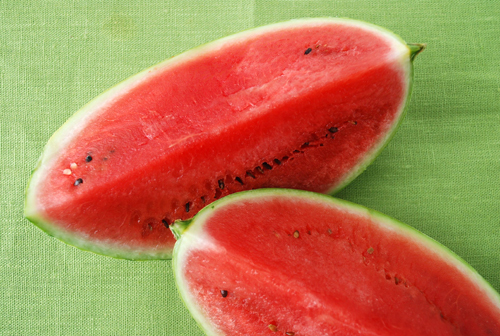 Serve with a dollop of the tahini dressing and the watermelon salad on the side. 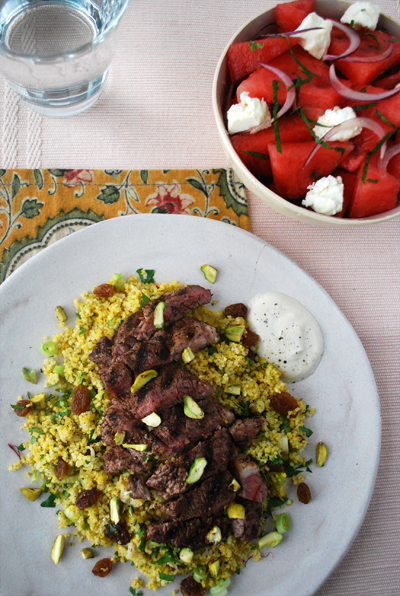 This entry was posted in Meat and tagged Lamb steaks, lamb with couscous, middle eastern lamb, moroccan lamb, pistachios, saffron couscous, watermelon and feta salad, watermelon salad on 27/09/2012 by Val McArthur.